Warm sunny days, crisp cool nights, leaves beginning to change… Autumn is the perfect time to enjoy the outdoors. That makes it a perfect time to get the maximum use out of your Titan Screen motorized retractable screens. 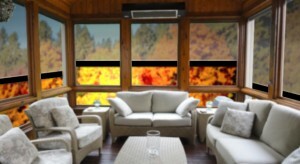 Titan Screens will help control the temperature and airflow of your 3-season rooms. On bright, sunny, dry days, retract your screen to enjoy all the beautiful fall colors with no barrier. When the wind picks up, you can roll your screens down with a push of a button. The screens will reduce the wind flowing through your room and keep all the blowing leaves outside where they belong. Add an outdoor heater, and you and your family are enjoying your outdoor lifestyle well into November and later.